Under the bright light of a fluorescent tube, Mrs. Fang is dying. The 68-year old woman from a small town in Zhejiang province, China, is suffering from Alzheimer’s disease. 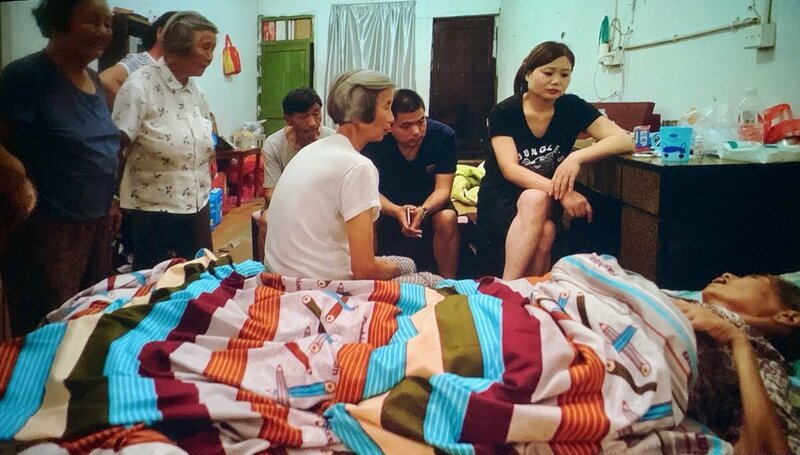 The care her family and neighbors have for her is on bright display in the documentary Fang Xiu Ying by film maker Wang Bing. Mrs. Fang before her illness bound her to bed. Still from Wang Bing film Fang Xiu Ying. The film has no narrator, no interviewer, no special effects. It’s just showing people gathered in the room of a small rural home where a dying woman lies on her bed during her final ten days, unable to talk. At times, Bing has his camera just focused on her face, her eyes looking straight at you. Mrs. Fang’s village in southeastern Zhejiang province, China. Still from Wang Bing film Fang Xiu Ying. Women feed her water by the drop through a little dispenser. As Mrs. Fang lies on her side, the drops seem to just flow out of her mouth and onto her pillow. They keep trying. Bing’s film really transports you to this rural Chinese village. You’re there as a fly on the wall as the men sit outside eating, and drinking beer, rolling up their shirts to expose their bellies because it’s hot. One of the men seems startled by the size of his own belly. Bing’s camera captures it. Mrs. Fang at home, cared for by the people around her. Still from Wang Bing film Fang Xiu Ying. The tv in the room is always on. Mrs. Fang gets tugged in, rolls a bit, and stares into the camera. Almost dead, but still alive. Her actual dying moment isn’t shown. Of course not. Nor is any cremation or burial. That’s not what this film is about. It’s the care for Mrs. Fang that takes center stage. Once that ends, so does the film. And you leave it with a surprisingly upbeat feeling. I saw ‘Fang Xiu Ying’ at Kunsthalle Zürich, where it is shown a few times daily in tandem with another Wang Bing film: ‘Man with no Name’, until 03 February 2019.